The Division of Technical Sciences was established in 1990. From 1990 to 1997 it was headed by Algirdas Žukauskas, from 1997 to 2005 by Ramutis Bansevičius, and from 2005 to 2013 by Vytautas Ostaševičius. The current head of the division is Gintautas Žintelis. 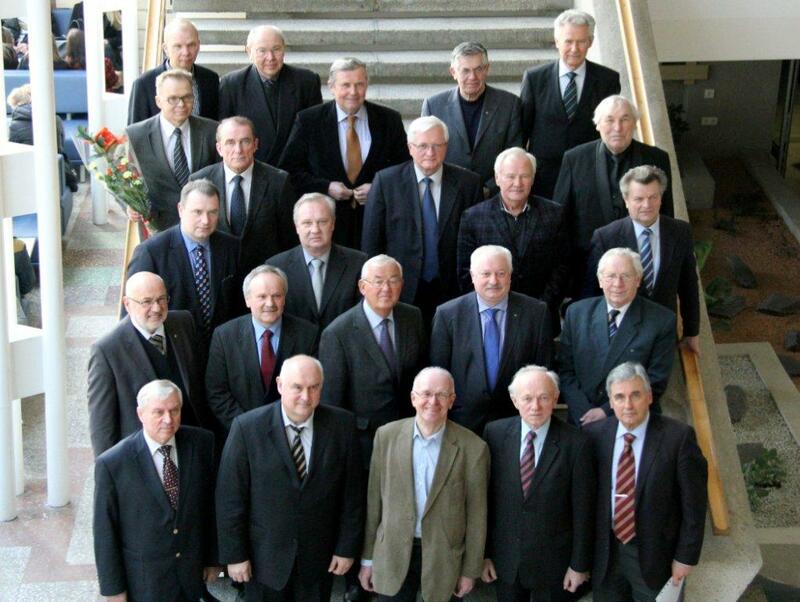 The division has 20 full members, 12 members emeriti, and 12 foreign members. It carries out its activities in five sections. The members of the division conduct research in the field of technological sciences and analyse research themes and results. They conduct qualified expertise in evaluating scientific research, projects, studies, innovations, competition entries, and applications on behalf of the Government, ministries, and other institutions, or commissioned by them. They also provide consultation, submit proposals, and participate in the design of hi-tech development programmes and projects, in the expansion of the collaboration of research, studies, and business, and in stimulating research activities of young scientists. Members of the electronics and information science section achieved excellent results in the theory and practice of recognition of the words and phrases of the Lithuanian spoken language (Adolfas Laimutis Telksnys), issues in global and discreet optimisation and data analysis (Jonas Mockus, Gintautas Dzemyda, Antanas Žilinskas), system and process modelling, identification, and management (Vytautas Kaminskas), design automation (Gintautas Žintelis), and design of environment protection technologies (Jurgis Kazimieras Staniškis). The resolve and activities of Jurgis Vilemas, Eugenijus Ušpuras, Algirdas Kaliatka, Juozas Augutis and their colleagues were instrumental in bringing the safety of the Ignalina Nuclear Power Plant to the level of safety of nuclear plants in the West. At present the main focus is placed on the development of increasing use of the renewable power sources in the world and in Lithuania (Jurgis Vilemas), the conceptual design of the DEMO nuclear fusion power station (Eugenijus Ušpuras), and on active search for energy safety solutions (Juozas Augutis, Algirdas Kaliatka). As members of the school of precision vibromechanics, vibrotechnology, and robotization founded by Kazimieras Ragulskis, the academicians of the section of mechanical sciences have established their own directions of research: mechatronics, a synthesis of mechanics and electronics (Ramutis Bansevičius, Genadijus Kulvietis), technologies of microelectromechanical systems (Vytautas Ostaševičius), new functional and technological mechanisms for the defence, machine, and equipment industries (Algimantas Fedaravičius), and digital analysis of dynamic systems (Minvydas Kazys Ragulskis). Members of the section of materials engineering intensively develop methods of ultrasound diagnostics and their application (Rymantas Jonas Kažys, Liudas Mažeika), carry out polymer synthesis and research (Juozas Vidas Gražulevičius), seek weighty scientific results in the field of vacuum and plasma technologies (Sigitas Tamulevičius), conduct research into the processes of welding of ferrous and non-ferrous metals, formation of surface coating, thermal structural aging of materials (Algirdas Vaclovas Valiulis), design and develop methods of instrumental analysis and apply them in molecular analysis of biological objects (Audrius Sigitas Maruška). Research conducted by the members of the civil engineering section addresses engineering structures, their elements and materials (Rimantas Kačianauskas), technologies and organisation of building construction, decision-making theories and automated design, expertise and decision-making support systems (Edmindas Kazimieras Zavadskas, Gintaris Kaklauskas), mechanics of reinforced concrete structures (Gintaris Kaklauskas), cement chemistry and technology, synthesis and qualities of calcium hydrosilicates (Raimundas Šiaučiūnas). Members of the division have attained international recognition: they are foreign members of the academies of sciences of other countries, honorary doctors of foreign universities, members at international research organisations, scientific journals, committees, and federations, and carry out qualified expertise for international programmes and projects.